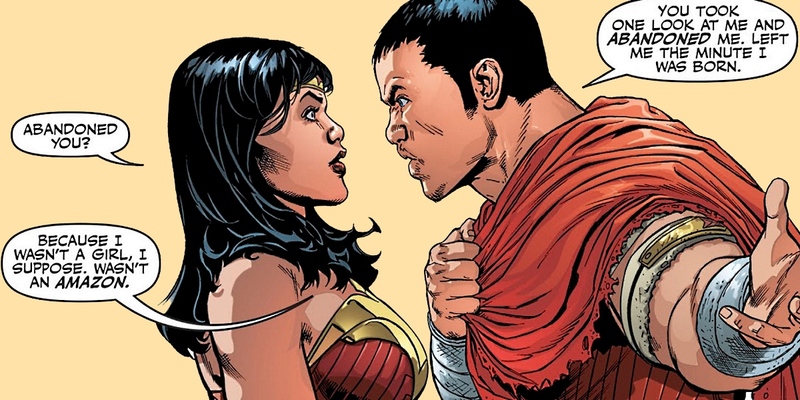 Superman & Wonder Woman's Son To Kill [SPOILER]? 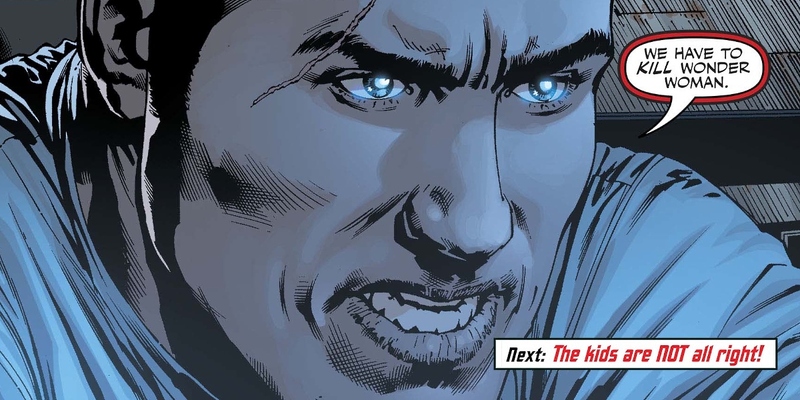 The fans of DC Comics didn't expect to meet Superman and Wonder Woman's son - but they definitely weren't ready for the leader of the future Justice League to plot the murder of his own mother. That's the story currently being spun in DC's main Justice League series, with the modern day heroes still unsure about the first villain they defeated as part of the company's "Rebirth" relaunch. They seemed to win the day against cosmic conquerors... but as their children informed them personally, the future has already been lost. Fans have already been introduced to the Justice League's future children (the brainchildren of Bryan Hitch, Fernando Pasarin, Oclair Albert, and Brad Anderson), but as exciting as the offspring of Green Lantern and Flash, or Cyborg's next-gen son may be... it's Hunter Prince who has stolen the spotlight. First, by being the biological son of Wonder Woman. Second, by being raised by Superman. But given those heroic connections, few would have thought him a murderer. Those curious to know how the Justice League's superpowered children were introduced to DC's Universe should check out our character breakdowns, but for Hunter Prince, his origin story is one built in mystery and sadness. He may have the most visible family links in his costume, wearing Diana's Amazonian bracers, her tiara strapped around his immense bicep, and her eagle insignia pinning Superman's cape about his shoulders. But for reasons neither he nor readers will understand... Wonder Woman abandoned Hunter not long after he was born. Thankfully, a child in need of love is the kind of thing to catch Clark Kent's eye. Just like his parents before him, Clark took Hunter in as his own son, and raised him as Jonathan's younger brother. While it gave Hunter a happy childhood and early life - as he confirms in Justice League #28 - the darkness into which the world was soon plunged brought it all to a halt. Superman fell in the fighting just as his son, Jonathan did... and only the children hidden away on Themyscira survived the devastation of the villain named Sovereign. It's that future from which the children have returned, and the one which they're working to keep from taking place. Unfortunately, Sovereign may have its roots in the modern day League. Is The Future Broken By... Wonder Woman? The exact nature of Sovereign is a bit complicated to explain (and the villain's true identity may already be deduced from DC's teases), and the same goes for the Kindred, the cosmic beings who visited Earth and set the ball rolling, and the "darkness" which ultimately infects the world. The bottom line is that readers who assumed something was being misconstrued, kept secret, or purposefully omitted were right to do so - and Wonder Woman shared the same doubts. The only problem is that detecting the 'truth' of something is kind of her thing - and when the portal opened to deposit the children from their time to the League's... Diana felt her connection to the future still to be formed. That same connection was felt to the darkness itself when the League fought it back. All the evidence and nagging voices in Diana's head add up to her having a role to play in the future that destroys the world. A war that wipes out Earth's heroes. And leaves a son she somehow never wanted without a mother. Diana is too much of a hero to ignore those impulses, which leads her to a shocking conclusion: she may be the one who kills the world. As we mentioned before, Cube, the son of Cyborg is even more advanced than his father ever was, shaped by Apokoliptian DNA to engage with every information transmission on the planet. Unfortunately for Diana, that also includes the surveillance networks on the Justice League Watchtower. So when she weighs the evidence and determines that she may be the reason the world collapsed... Cube witnesses it along with her. And considering that the children have come from the future to prevent that collapse through whatever means necessary, the solution is simple for Hunter Prince. For obvious reasons, we have our doubts that the children will achieve their goal of killing Wonder Woman. But hitch has laid the groundwork for a gut-wrenching, gimmick-free tragedy nevertheless. From his point of view, Hunter is willing to kill thousands if it means saving the billions he and his fellow Justice Leaguers watched killed in their future. So if the answer is simply to kill ONE person - and that person is the woman who abandoned him, as he perceives it - all the better. 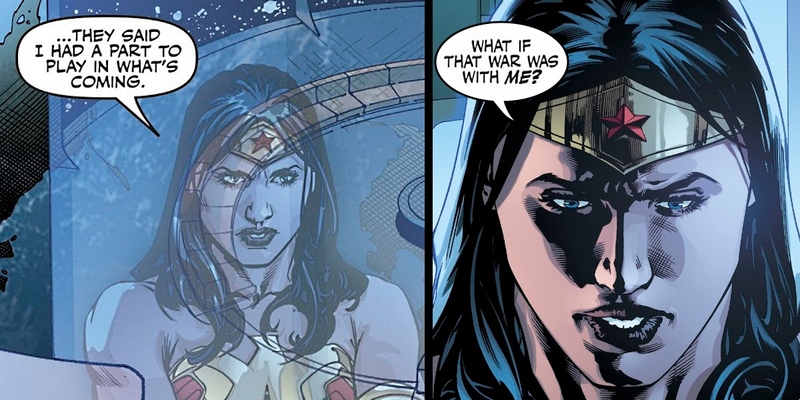 The questions remain: is Wonder Woman responsible? Why would she leave Hunter to Superman? Will the happier children oppose their leader when he moves to murder? And what fate lies ahead for Hunter Prince? For that, we'll need to keep reading. Justice League #28 is available now. NEXT: DC Just Rewrote Superman's Origin Story?